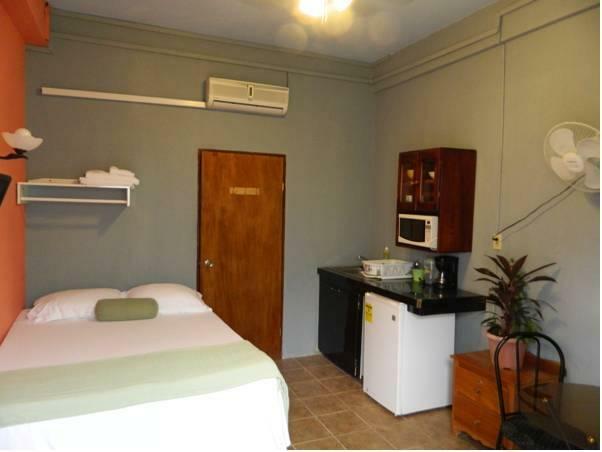 ﻿ Best Price on Bella Sombra Guest House Downtown in Belize City + Reviews! Located in central Belize City, Bella Sombra Guest House Belize offers a garden, terrace and air-conditioned studios with free Wi-Fi and basic kitchenettes. St John’s Cathedral is a 15-minute walk away. Each functional Bella Sombra studio features cable TV, a clock-radio, a ceiling fan and a private bathroom. The simple kitchenettes include a microwave and mini-fridge. Free private parking is available at the Bella Sombra Guest House. Convenience stores and cafés can be found in the surrounding streets. The ferry terminals for Ambergris Caye and Caye Caulker are just 1969 feet away. On request, the Bella Sombra can arrange airport transport, flight transfers and excursions. Belizean Beach is a 15-minute drive away, while the Mayan temple of Altun-Ha is a 45-minute drive away. Mexico's Embassy is just 5 minutes' walk away. This property accepts PayPal payments. Please inform Bella Sombra Guest House Downtown of your expected arrival time in advance. You can use the Special Requests box when booking, or contact the property directly using the contact details in your confirmation.